LEED (Leadership in Energy and Environmental Design) is simply a green-rating point system, or a scorecard. The more energy efficient and sustainable a building is, the more points it will earn. To date, this course and its materials have proven to be instrumental in helping over 3000 students pass their respective exam at a 100% pass rate. This course is offered at a quarter of the price and time as the competition and is geared at allowing students to graduate with letters after their name! Just as Buildings can be LEED certified, people in the sustainable construction industry can become LEED Professionals. The LEED Green Associate (GA) credential is the only entry level sustainability designation and shows employers and clients that you have certified knowledge in the green building industry. 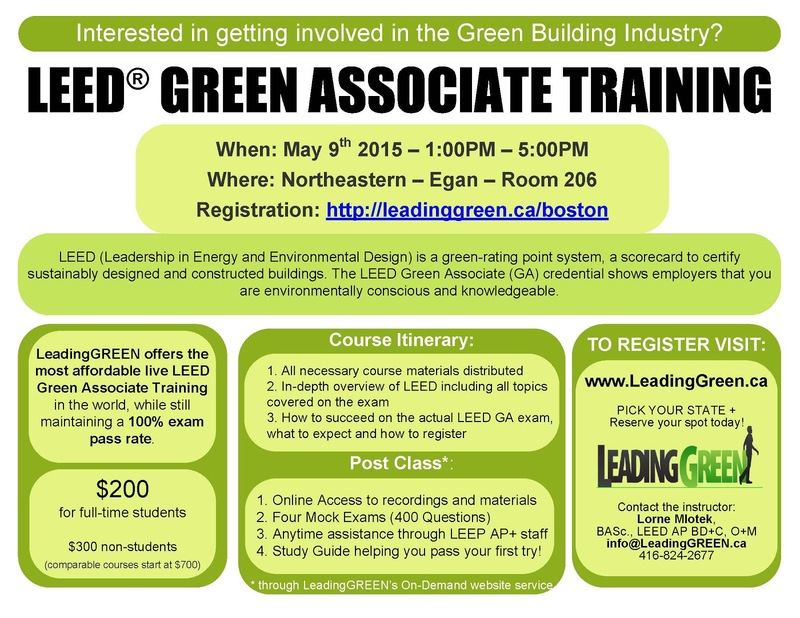 A new LEED rating system (v4) was introduced last year and this training course is one of the few that has been updated to teach the current rating system. This course meets the exam’s eligibility requirements and the USGBC charges a $200 fee for the actual exam which can be taken at any time at your nearest Prometric center.